It’s long been said that the kitchen is the heart of the home. It’s where you prepare family dinners and teach your children the proper baking techniques. With so much emphasis placed on the kitchen, you need to put your wants and needs first when renovating. To help get you started, here are some pro kitchen design tips. Home remodeling projects can completely transform your space, making you feel more at home and cozier than ever before. To help you get some ideas, we’ve outlined seven of the most popular home renovations below. Thanks to Pinterest, magazines and TV shows, updating your home seems more possible than ever before. They show you the amazing before-and-after photos and tell you exactly how it’s done. Above all, they inspire you to finally start those home renovations that you’ve always dreamt about. But realistically, how much are new cabinets or windows going to cost you? There are a lot of elements that go into a kitchen. So, when it comes time to remodel, it can be hard to pick and choose which parts are worth investing your time and money into. Especially since it’s often the main focal point of the house. If you plan to resell in the future, think about how your new kitchen will look to prospective buyers. Will they be awed by the cabinetry? In love with the countertops? If you’re considering remodeling a kitchen, here are some of the top areas to invest in. If you’re thinking about redoing your deck, be careful not to overlook the railings. The rails add the perfect finishing touch and can tie the whole space together. While the deck railings’ main purpose is safety, they can also become a beautiful statement piece. 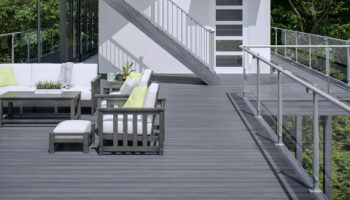 Check out these five different types of deck railings for inspiration. Every year, the Pantone Color Institute chooses a color that sets the current standard for trend and design. The Pantone Color of the Year for 2018 is Ultra Violet – a blue-based purple that’s both dramatic and thought-provoking. Learn more about this rich color, and how you can use it to spruce up your interior design.